Here's my easy homemade fudge recipe. This one is so easy my daughter makes it herself with no supervision, except for the cleaning up. This recipe is deliciously full of calories, is a NO-BAKE recipe, and takes just 3 ingredients. It's a matter of mixing together the ingredients and popping the tray in the fridge to firm up. It's so easy it is a wonder we're so restrained that we manage to make it only occasionally to minimize the impact on our hips! When the children make it, they decorate it with whatever takes their fancy, whether it's chocolate flakes, coconut or just hundreds and thousands. 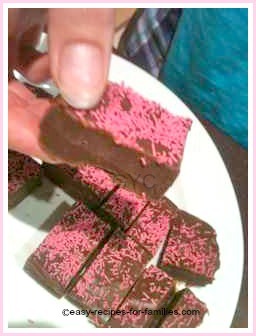 For grown ups, it's lovely exactly as it is - just plain rich chocolate fudge. This recipe makes about 30 slices of fudge. •	Leave it for a couple of hours in the fridge to set. •	Cut into one inch squares and enjoy! Use silicone bake ware so as to eliminate the step of lining and greasing cake tins. 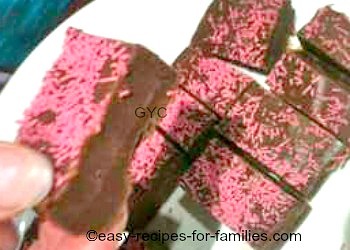 If the family can manage to not devour them all, the easy chocolate fudge makes a terrific gift. Put a few on a little paper plate and wrap with cellophane paper. For the children, it is easiest for them to wrap them individually in colored cellophane paper, and twist the ends, like candy wrappers.